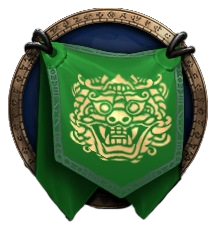 As promised, a storage guild for little used toons has been created on Arygos. Any toon you don't want to delete, but aren't going to play is welcome to be placed in this guild. We have a tabard! And someone in the guild has Thori'dal because we got that achievement as well as the "Design a Guild Tabard" achievement. You must be a member in good standing within Spectacular Death to take advantage of this guild. If you leave SD, your toons will be removed. This is mainly so your unplayed toons don't wrack up months and months of inactivity and get kicked, but can still be available and avoiding Dark Oaths "please come join our guild" auto invite spam. 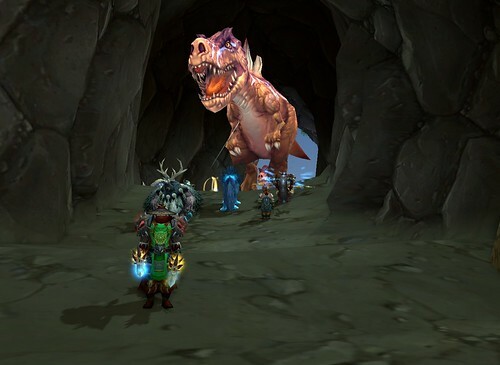 It's perfect for Legacy toons which you will trot out when we're doing Legacy events. Those toons can be invited back into SD and can then return to "Eats Bacon" when you're done with them. There was no bacon icon, a situation which Blizzard should remedy. I bought a whole bunch of guild tabards, ran to the bank, bought the first bank tab, and discovered the tabards are soulbound. /sigh So, you'll need to buy your own tabard. BUT, we have the first bank tab and everyone can dump stuff in it. I swear I'm not buying the next one. This is supposed to be a storage guild. Which brings up a membership issue. There are a few people who still don't come to their required 2 events per month to remain in SD. Letters will be going out and you'll have until March 20th and our annual "End of Winter Bash-With the Emphasis on 'Bash'" event, to rectify this. Two events, that's all we ask for. If that is too much for you to do, you need to leave or Miz will sing a lovely song when she kicks you. I can't sugar-coat that. We want people here who participate in the life of the guild. Some of you don't seem to "get that". Consider this the only warning you will get. 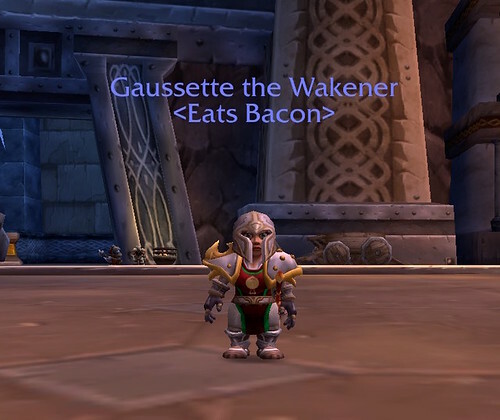 If you need to put toons in "Eats Bacon", just ask in chat. I can hop over to Gaussette and add you. 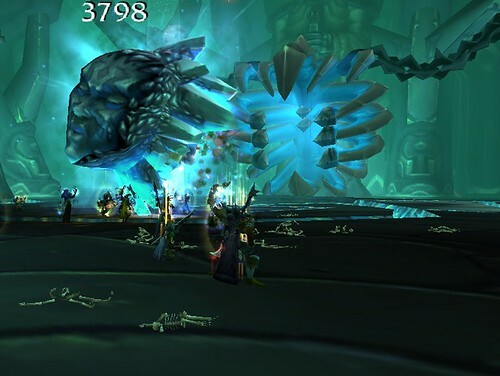 Black Temple Timewalking! This week! Timewalking this week, revolves around Burning Crusades dungeons. But also returning for a second go-'round is Black Temple. We got as far as Bloodboil last time. There was the frustrating bug that if you didn't finish the raid, you couldn't save it so every attempt was brand new. Well, Black Temple, at level, was a 4 hour affair, and we just don't have that kind of time. BUT...this is a great way to see the fights as they were designed, mostly. We're going to make two attempts to clear. The first is on Tuesday. You need to get yourself to the summoning stone in (old) Shadowmoon Valley by 8:45. Two tanks; 4-6 healers; and the rest dps, up to a total of 30 people, can come. Back in the day, you had 3-4 tanks; 6-8 healers; and the rest, dps, up to 25, so we're a bit better on numbers now. Any toon from level 70 up, can come. Bring that Legacy toon! There are battle pets and transmog gear to obtain. We aren't sure if we can clear the place in the first 2 hour session. You spend way more time running from point A to point B, than actually killing boss. Concubines. So.Many.Concubines. We will continue the raid Friday night and hope they fixed that bug. 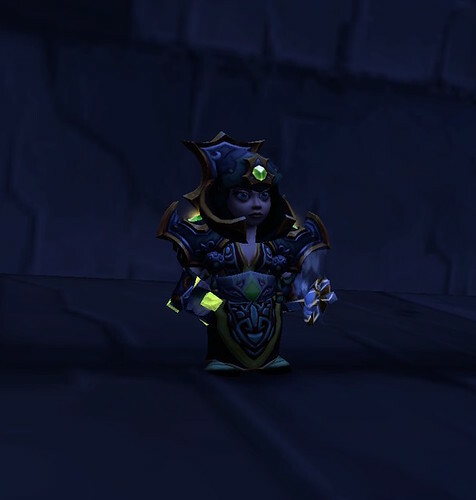 AS A NOTE: Because we are going back into Black Temple, the transmog contest is moved UP 30 MINUTES TO 8:30 P.M. Be ready to move to the special location at 8:15. That location is somewhere in the Eastern Kingdom. The theme is "Make a Tmog that glows". No enchants are allowed. The glow must come from the piece itself. Those of us with Prydaz will be asked to remove it for the contest. If someone with a mage would come to the contest, it will make getting people to Outlands and Black Temple, easier. We have an alternate plan should Black Temple still be bugged. We will raid and you'll love it. Thursday, we will be doing the popular "Deepwind Dunk" Special Battleground event. This is so much fun. Even if you hate PvP, you might like this so long as you realize you'll get killed by other players. That's just kinda how PvP works. But the way Blizzard designed this makes it a lot more fun. In one week, there will be an officer meeting to plan February. If you have something you'd like to suggest, or you need a raid run for you, just send an officer an in-game letter. We have some interesting ideas for events, but we always like to hear what you have in mind. It's been a couple years since we did the contest. Here's how it works. Your task is to come up with a caption, or two, or three, or more. Captions must be PG. You'll post them to this forum thread. Captions posted here do not count. Each caption needs to be a separate entry. I'll be judging this contest. First place gets 500 gold. Second place gets 400 gold. Third place gets 300 gold. Yes, there can be ties. Contest begins today and ends on Sunday, January 21st. Winners will be announced on Monday, January 22nd. Good luck. Four people entered looks in the December 2017 transmog contest. The these was "Ten Years of Gears". Your transmog need to have a piece from each of the expansions: Classic, Burning Crusades, Wrath of the Lich King, Cataclysm, Mists of Pandaria, Warlords of Draenor, and Legion. Tarsan was the judge. Here he is judging Winterlight, who was the winner of the December contest. Second place went to Minaithalen. Third place was a tie between Rolandgilead and Gimmlette. 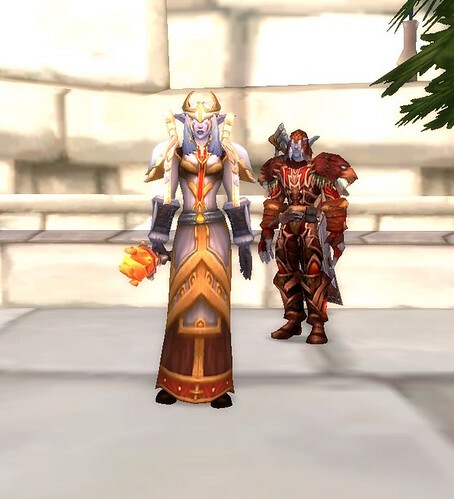 January's transmog contest theme is courtesy of Silverkeg. His idea is to make a transmog that looks good in the dark. Here is an example. No enchants will be allowed. The glow needs to come from the pieces themselves. Some items "stand out", shall we say, even without glowing. We will not be meeting in our usual place for this contest. We will be meeting in Ironforge on January 26th. There are a couple places where darkness rules. The contest will also be starting one half hour earlier, 8:30 pm, so we can run Antorus afterwards. Congratulations Winter and I look forward to seeing what transmogs you can come up with for January.